I can't come back from a kayaking expedition without buckets of rocks, sand, pebbles and shells. On a trip to Rock Hall, a friend and I tripped over a program on sea glass. I'd already, inadvertently, collected some, even using it in one faerie house. I had no idea it was a Thing. As in, people collect it seriously like seashells or antiques, they know the history and geology of good sea glass beaches, make a distinction between sea glass (saltwater) and beach glass (freshwater), and divide their finds into various grades of awesome from jewelry grade to throw it back and let it cook longer. So a friend and I set out to some names that had been mentioned: Tolchester and Betterton. We found dozens of small pieces ranging from excellent to throw it back (but don't, it'll still look good on a faerie house). 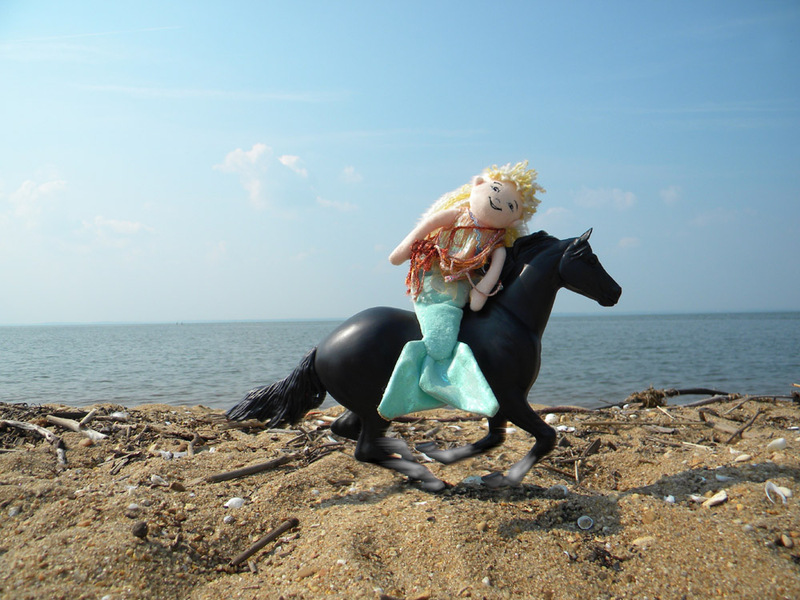 Of course, the mermaids and horses... and the dragon... came along. The blond mermaid is a Douglas Cuddle Toy about 8" long. The large brown eyed mermaid with purple hairstreaks is an Aurora, and is advertised as being in the Baltimore Aquarium's gift shop. I didn't see her or her friends in the gift shop when I was there in August, but did find, in the Aquarium gift shop, the red headed one with the turquoise tail... whose tags I ditched and whose image I can't find online, so I have no idea what she is. Toothless, of course is from Dreamworks' How to Train Your Dragon films. Olaf is.... oh come on, you haven't seen Frozen like 263489179 times? The large black and turquoise horses are from Our Generation (originally black, and white). 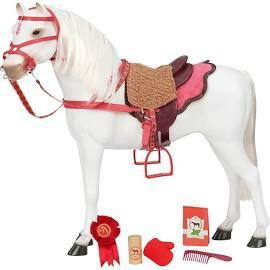 Nice toys that have fairly decent anatomy and luxurious manes and tails without being ridiculous and pink and crap. They are to the scale of American Girl dolls (and their clones). 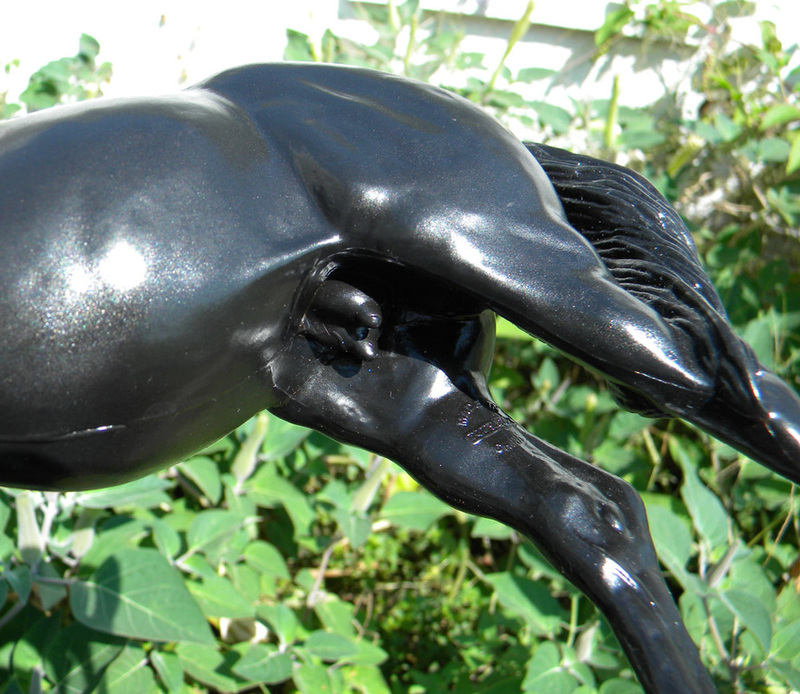 They are much nicer than the American Girl horses and don't have the problematic fabric skin (whattheeverlovinbleep were you thinking putting fabric skin on a toy horse!?!?!?!?! Oh, that'll hold up well on those adventures in mucky salt marshes...). 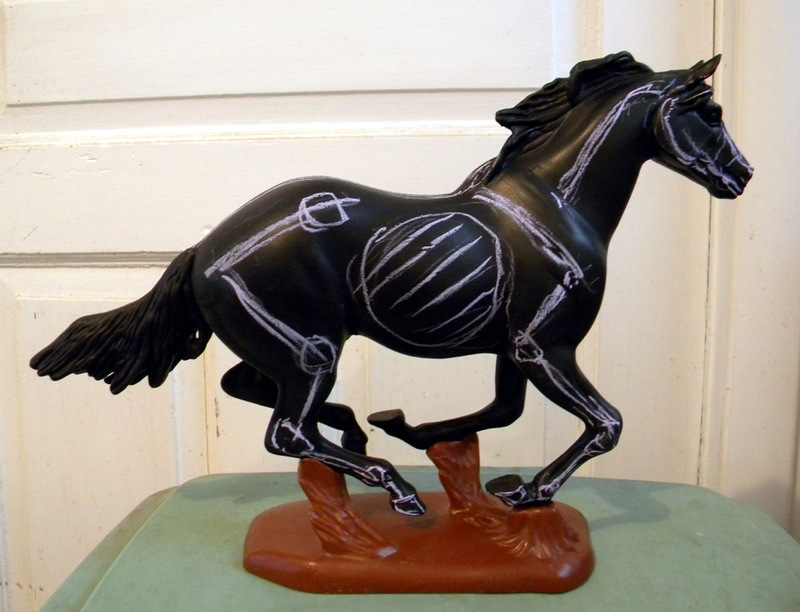 The anatomy and tack on those AG horses is pretty appalling too. Also doesn't help that most folks posting pics don't know how to saddle a horse. The Our Generation tack is sometimes weird colors (like pink, but then have you been to a horse show lately? There's western saddles in turquoise tiger stripes and stuff) but is generally functional. Which is either a bad interpretation of a Criollo pony bridle, or a bad interpretation of a flash noseband on an English bridle. The cheekpieces are missing. Also not sure what that saddle is: may be an endurance saddle (a sort of crossbreed of English and Western) or Aussie stock saddle? Also set far too far back on the back(girth should be under the horse's elbow). Nice horse though. 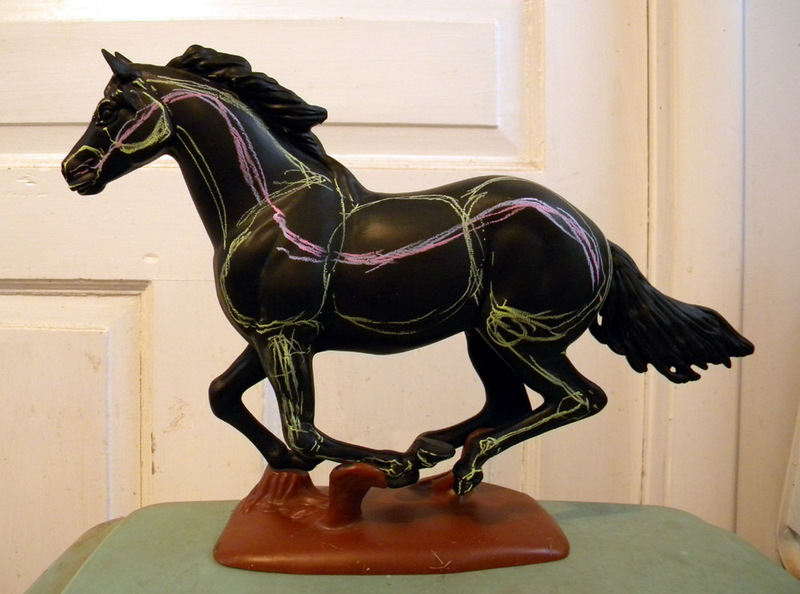 He was a nice cheesy plastic horse with not too bad conformation. I painted him with chalkboard paint and use him in art classes to block out basic shapes and to show where the bones are. 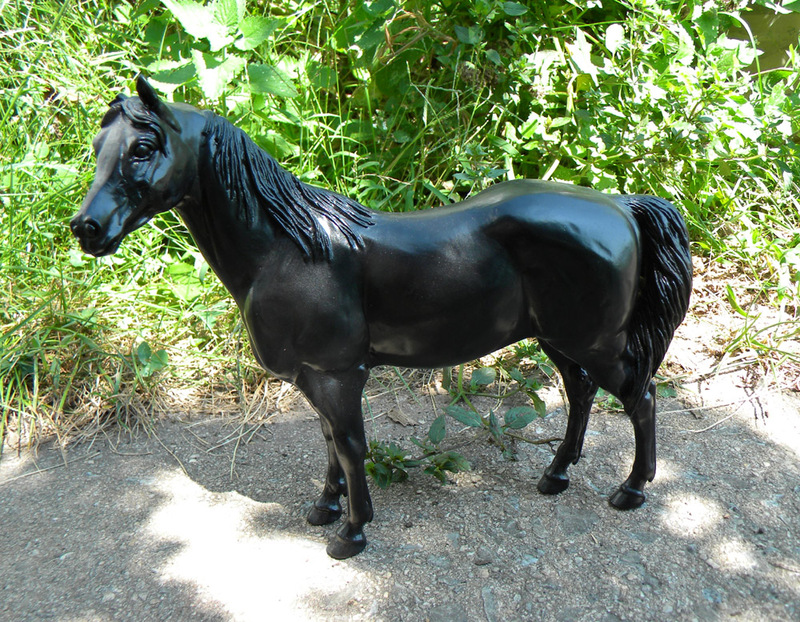 In the beach scenes, I used Photoshop to eliminate his base, and to give him socks to match the Breyer Morgan model. 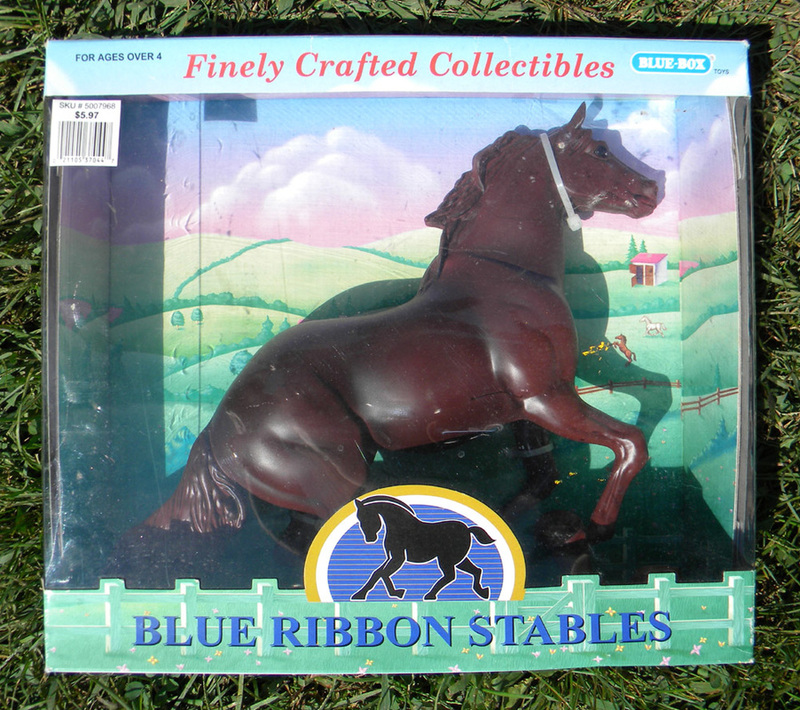 He turns out to be a made in China "Blue ribbon Stables Finely Crafted Collectibles" by Blue Box Toys. Several oldish versions (20+ years) are listed as vintage collectibles on Etsy and other places. ... OK, finely crafted is a bit of a stretch. That is reserved for Breyer. 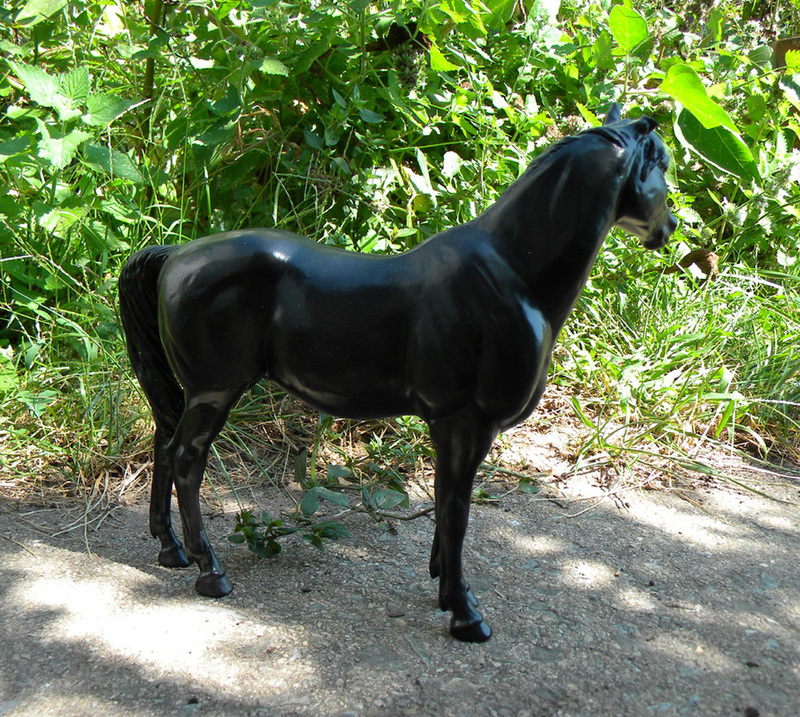 These aren't bad, especially with a repaint, or a slight remodelling (the original was a stupid cheap $5.97, and was going to be part of a centaur), but not worth $24 as Etsy suggests. Still he and his buddy are far more reasonable representations of the equine model than 99% of little girly toys and My Little Mystery Beast (I have no idea what it is but it certainly isn't equine). The Blue Box toys logo looks very much like a classic Chinese horse as seen in their traditional art. And above: this nice little Arabianish mare from Blue Ribbon (ear was broken when I got her). Clearly modelled as a mare! Unusual detail for a cheap plastic toy. Now working on a green screen so characters can be put into shots later.